Drive knowledge sharing and communication to develop a truly forward-thinking workplace by promoting efficient and collaborative meetings. Any meeting room can benefit from interactivity with our latest ultra-short-throw projector, featuring dual pen capability, a high brightness level of 3,800 lumens, Full HD WUXGA resolution and remote multi-location connectivity. The ultra-short-throw EB-1440Ui is designed to present a scalable screen size of up to 100 inches to deliver the requirements of any business working environment. Full HD WUXGA resolution combined with Epson’s 3LCD technology ensures high-quality content has more vivid colours and brighter images. HDMI connectivity also means that the audience benefits from sharper and clearer content displayed in any meeting room environment. This interactive meeting room solution combines the benefits of flipcharts, whiteboards and conventional screens into one unified meeting room solution. Meeting participants can view and annotate whiteboard content from a range of smart devices, without the need for any special application, ensuring information remains secure with the ability to apply passwords to meetings and notes. The remote desktop feature promotes freedom from the desktop – simply leave your PC, including those running Windows 10, on your desk and present from anywhere around the office. Take advantage of Skype in business and other video call solutions during meetings. Epson’s interactive pens are now even more responsive and easy to use. With the new dual pens, colleagues can work simultaneously using different pen attributes. Combine two sources and project, such as multi-source video conference and presentation, to optimise interaction. Share content easily from a range of smart devices using the iProjection App. 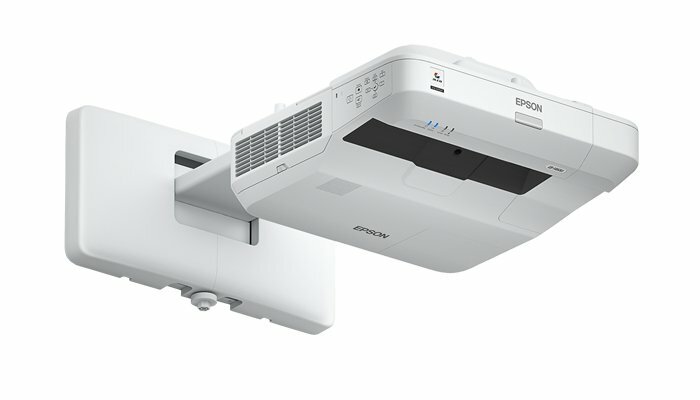 Contact Highline today to discuss our Epson Projectors, including displays, software and accessories. Here at Highline Office Technology, we will work with you to identify exactly what hardware and software you need to build a bespoke solution to suit your precise requirements. Matching the right products with your needs is a vital first step in setting up an efficient and cost-effective system.